U.S. President Donald Trump waits for reporters to leave the room after speaking about his summit with Russia's President Putin during a meeting with members of the U.S. Congress at the White House in Washington, July 17, 2018. President Donald Trump continues to defend his recent summit with Russian President Vladimir Putin. 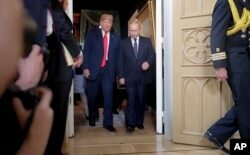 Trump said Monday on Twitter that he made no concessions to Putin in their meeting last week. The president’s performance got a negative review in the latest Washington Post-ABC News poll, which found that 50 percent of Americans disapproved of his handling of the summit, compared to 33 percent who approved. In recent days, both Democrats and Republicans have criticized Trump's Helsinki performance. A larger than normal chorus of Republicans also expressed dismay about the Putin meeting - including one of Trump’s few regular Republican critics, Arizona Senator Jeff Flake. “We have indulged myths and fabrications and pretended that it wasn’t so bad, and our indulgence got us the capitulation in Helsinki,” Flake said in a speech on the Senate floor. Trump defenders spoke up as well, including 2016 Republican rival and Texas Senator Ted Cruz. After several days of criticism, Trump issued a stronger statement on the threat of Russian interference in this year’s midterm congressional elections. “Unlike previous administrations, my administration has and will continue to move aggressively to repeal any efforts and repel. We will repel it. Any efforts to interfere in our elections,” Trump told his Cabinet last week. Trump’s summit drew strong reactions from voters around the country as well. “Putin is almost like an evil genius in a way. He is very manipulative and he knows what he is doing and I think Trump really got played,” said one Trump critic interviewed by VOA’s Russian Service in New York City. Trump supporters were quick to jump to his defense. “I think it all boils down to, point blank, a sore loser. And they are just grasping at straws,” said a woman, interviewed by Associated Press Television, outside a coffee shop in Mississippi. U.S. President Donald Trump, left, and Russian President Vladimir Putin shake hand at the beginning of a meeting at the Presidential Palace in Helsinki, Finland, July 16, 2018. Analysts continue to debate whether Trump has hurt himself politically. ​Given Trump’s loyal political base, will many of them be swayed? John Fortier of the Bipartisan Policy Center is not so sure. In addition to the recent Washington Post-ABC News poll, a survey by CBS News found only 29 percent approved of Trump’s handling of the summit, while 56 percent disapproved. Among Republicans in the CBS survey, 68 percent approved compared to only 21 percent who disapproved. In the latest Wall Street Journal-NBC News poll, 45 percent of those surveyed felt Trump’s relationship with Putin was “too friendly,” while 29 percent disagreed and 26 percent had no opinion. So it remains an open question as to whether the summit will actually move voters in one direction or another, or simply be added to the long list of issues for them to sift through before midterm congressional elections in November.